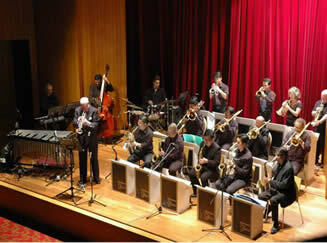 he Thomson Jazz Club was formed in 1993 by Eddie Chan Fook Pong as an activity of the Thomson Community Club. The club aims to promote jazz listenership in Singapore and to provide facilities for playing jazz. 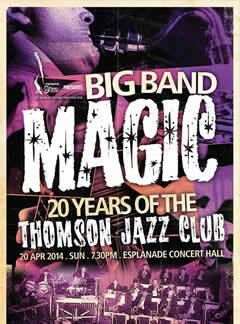 Beginning with only one band, Thomson Big Band, the Club has grown substantially in the last years. Membership has swelled to more than 100 members and we now have 3 performing big bands. Our second band, Thomson Swing Band, is fast developing a reputation of its own since making its public debut in December 1999. Thomson Jive is also progressing fast since forming in 2001. Equipped with 2 air-conditioned rehearsal studios, a performance auditorium and AV facilities, the Club is busiest on Sunday afternoons when our big bands rehearse. Our Bands perform frequently at public venues and for commercial engagements. We also seek opportunities to perform overseas. We frequently organise workshops and courses for our members to hone their playing skills and musical knowledge. Thomson Jazz Club gratefully acknowledges the continuing support of the National Arts Council and the Singapore International Foundation.